Okay so I’ve been slacking, not literally but in the blogging sense. I guess that’s what happens when your brain is on work mode. It’s crazy how fast time flies, you say oh I’ll do this tomorrow and then a month has passed. Luckily, I would never let myself do that with my training! I had a very smooth comeback post-injury. A lot of regenerative strength training to regain the muscle mass that I lost during my non-weight bearing injury. I was quite conservative. I ran hard workouts but kept my mileage lower. Coach Josh and I decided that I’d save the big mileage for the final build into the fall which worked well for my body. I stayed quite fresh for my races and had less time committed to mileage so I had more time for weight training. This was my 2nd race of the spring season post injury and my first ever trail race. Somehow it was 35 degrees and extremely humid this day which made for a challenging race. 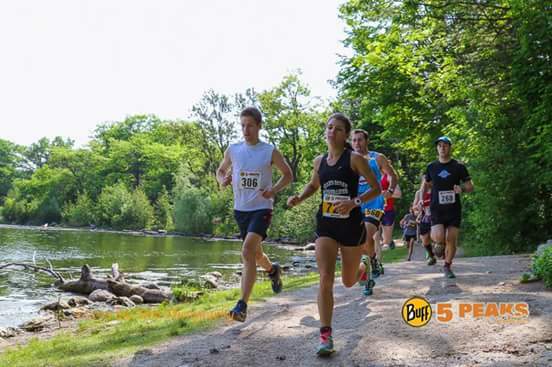 I went into the race thinking it would be super easy because not a lot of people run trail races – oh boy I was wrong. I chose the sport 8k instead of the 2 loop enduro 16k. I was never happier to go shorter with how hot it was. Off the gun we did a 90 degree hairpin turn and as I stumbled over my feet and finally looked up, I noticed there were 2 or 3 girls ahead of me! I was like, oh I’m not going to be able to coast, I need to push. As we got moving through the trails I was not pleased with the stumps and potholes and trees I needed to dodge. I was super paranoid about rolling my ankle. Trail racing was a new experience, with being used to having as much space as I want to move around people, it was quite a change needing to plan out where I could pass. After I realized it was going to be a challenging race, I decided to use it as an opportunity to work on my mental skills. I chased down the 2 girls in front of me, one girl was movin’ and I had a hard time catching her. The thing about trail races is they are hilly, I mean REALLY hilly. I decided it was a great idea to pass her right before a hill and then I had to walk briefly for a minute because I was dead! Of course she passed me again as I walked and I got going again and chased her down. Did I mention it was super hot? Well about half a kilometer later she stopped in front of me and started hyper-ventilating and dropped out of the race. I felt bad that I was instantly relieved- “yes I can slow down now,” I swear I said aloud. I relaxed my pace a bit and found my way to the finish while along the way clawing my way up a hill – hands and everything! I came across the line 1st female and 3rd overall relieved to be finished the scorcher of a race. This trail race was very good for me for several reasons: 1) Confidence booster for a win 2) first ever trail experience – reinforcing my love of the roads 3) working through the heat – I am not good with running in the heat and this was a good experience to learn how to still perform well in it. Results here. It was great to cheer on the rest of GRE teammates as they came in. Next in was Heather who tempo’d the Sport 8k and ran awesome still placing 5th female. Then we waited for the boys Josh and Ryan to come in. In came mud-covered Josh who won overall despite falling face first twice and Ryan came in 16th overall after just racing a half-marathon a week before, pretty impressive. Shout out to Mike Thornton who came all the way out to cheer us on and be the official photographer! More recaps in following blog posts! This entry was posted in GRE, race recap, running, training. Bookmark the permalink.